Removing dust and mold spores during book restoration and conservation - Sentry Air Systems, Inc. The art and precision of book restoration and conservation is a honed skill; one that involves countless hours of detailed yet delicate labor. The passion that goes in to restoring rare and antiquated works of literature is evidenced by the finished product. By removing layers of dirt and remediating mold spores from the pages, original script comes to life – but if you’re not careful those dusts and spores can expose you to a host of respiratory concerns. Common surface contaminants of old books are dust, dirt, stains and mold spores. Depending on the condition of the book and what type of contaminants are found, different restoration techniques may be used. These methods generate fine particulate matter and chemical fume that has the potential to become airborne. Once airborne, these particles are easily inhaled and can deposit on the lungs and within the airways. The Occupational Safety and Health Administration (OSHA) notes that not all dusts produce the same degree of health hazard; their harmfulness depends on the composition, concentration, size, shape and exposure time. A professional mold remediation expert should be consulted before handling books with mold spores. If given the all-clear to remove it, proper respiratory protection should still be used. According to the CDC, the inhalation of mold spores has a varying effect on individuals and can be especially harmful to those who are sensitive to it or have asthma. Exposure has also been linked to upper respiratory issues in otherwise healthy people. Sentry Air Systems has fume extraction and air purification equipment to help reduce the amount of particulate, mold spores, and fume generated during the restoration process. Source-capture units work to arrest fume and particles at the point of generation, where exposure is most likely to occur. This type of unit better protects the operator from respiratory inhalation exposure. Ambient air cleaners work to capture renegade particles and fume found in general room air. This type of filtration is great for freshening up otherwise stale or musty air; an issue commonly found in book storage areas where paper, leather and other fibrous material can off-gas odors. For source-capture filtration, we recommend our Ductless Fume Hoods (DCH) and Portable Downdraft Bench (DDB). Our DCHs are self-contained workstations that utilize a powerful fan to pull harmful air through the hood’s filtration system before recirculating cleansed air back into the room. The hood’s HEPA filter media effectively captures up to 99.97% of particles down to 0.3 microns in size. This type of filter is great for restoration techniques that produce dust, mold spores and other fine particulate. If your application generates fume or other VOC vapor, we suggest pairing the HEPA filter with an Activated Carbon filter to help in the adsorption of these fumes. 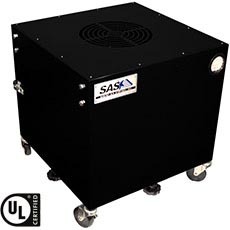 Our Portable Downdraft Bench is great for work environments that are on the move. This unit comes in either a standing or sitting configuration and the heavy-duty casters make moving the unit easy. The negative pressure, perforated work surface pulls harmful particles and fume down through the table and into the filter chamber. This unit’s compact design and ease of use makes for quick assimilation into labs, libraries, and museums. For Ambient Room Air Cleaners, we recommend our Portable Room Air Cleaners and Model 700 Free Hanging Air Cleaner. A Portable Room Air Cleaner (PRAC) is low profile and can be placed throughout a room for secondary air cleaning. 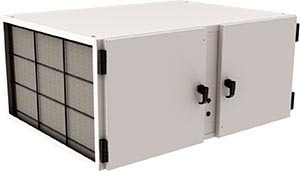 With a variety of sizes and air volume, Sentry Air has a PRAC suitable for most room sizes and environments. If floor space is minimal, suspend a Model 700 Free Hanging Air Cleaner from the ceiling. The Model 700 has two main filter chambers along with a pre- and post-filter that work to rid the air of particles and odor to provide a fresher work environment. All of the units recommended utilize ductless technology, and because the air is recirculated, no exterior-ducting or loss of heat and air conditioning is necessary. Disclaimer: Sentry Air fume extractors are not suitable for restoration techniques that utilize rubber or eraser dust as these particles may be combustible. If you would like more information or a quote, please contact Sentry Air at 800.799.4609, email sales@sentryair.com, visit our website or fill out the comment form below.